We can add a lot of additional information to a custom map. 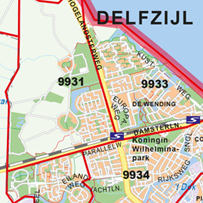 Postcode data and municipal data are very popular in general. Of course, there is more data that can be added, think of districts/territories, locations, routes, underground lines, cycle nodes, etc. The internet contains lots of data and information, and plays a huge role nowadays. So there is a great chance that we already have the requested data in our database. 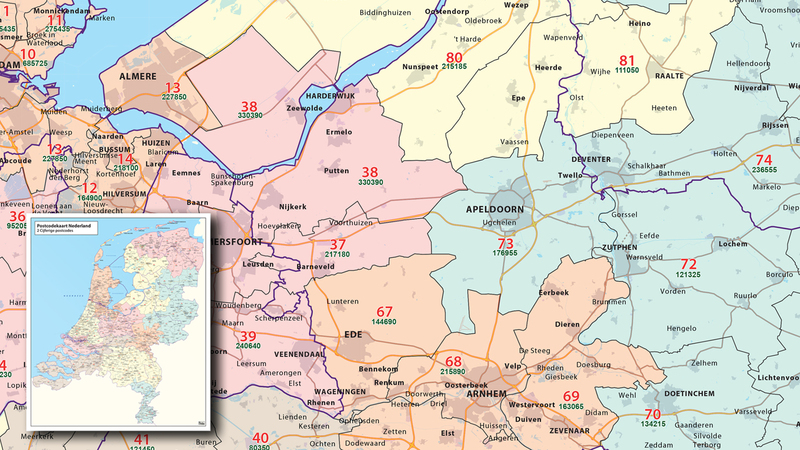 1 digit Position Postal Code Maps (1PPC) are often combined in large areas (Western Europe / Scandinavia). 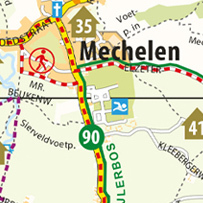 1PPC maps often contain some additional information such as larger places and/or highways. 2PPC maps are often made for customers who want some broad idea of where a postcode might be. Exact location is not needed. 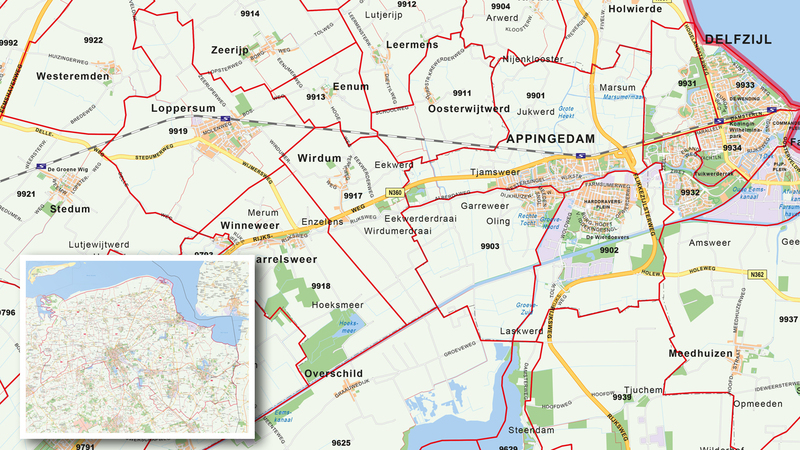 2PPC maps are also often used for regional and country formats that contain only a few regions. These maps already give a better and more accurate view of places and areas. 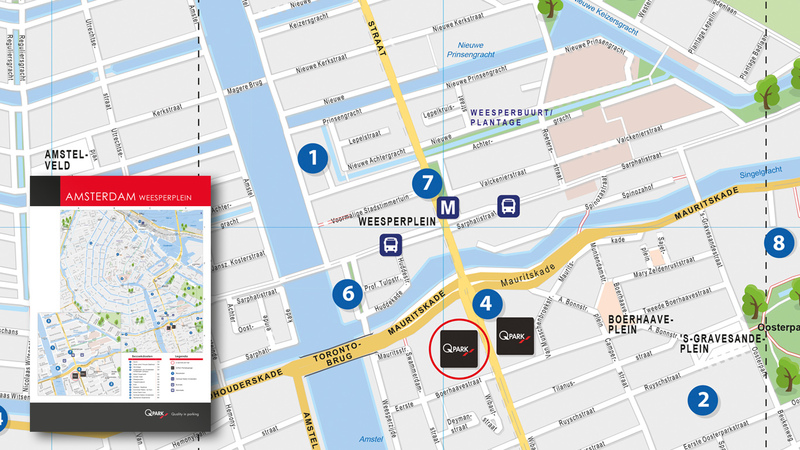 The maps are usually used by customers who find the 2PPC is too broad. The map is also suitable for a classification in regions. 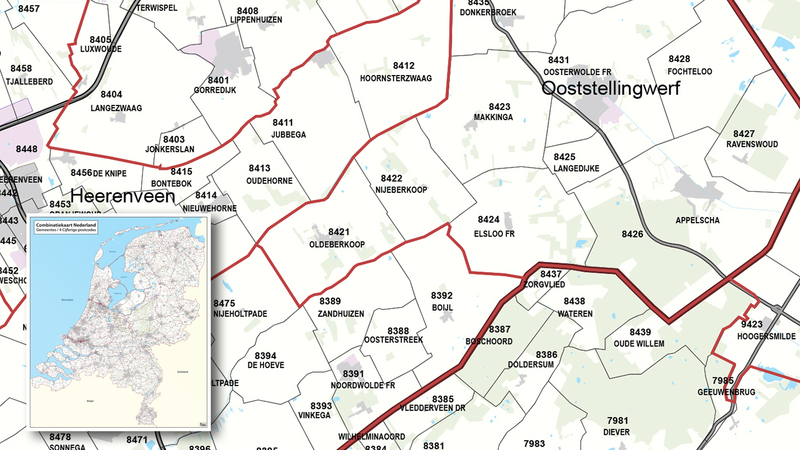 We can also include local/municipal boundaries and county/provincial boundaries on our maps. 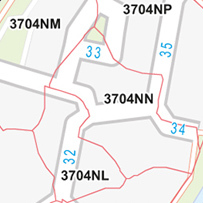 Sometimes these boundaries are used in combination with postal codes. 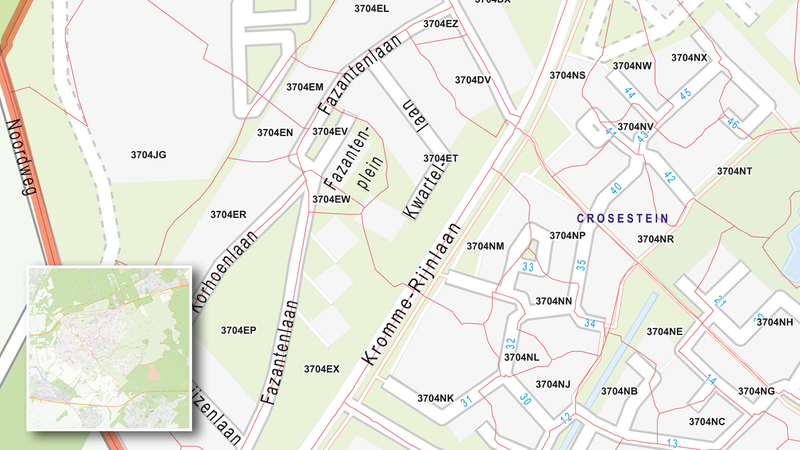 With a municipality map, the municipal boundary can serve as a demarcation between important and less important information, also used to highlight certain area's within a map. 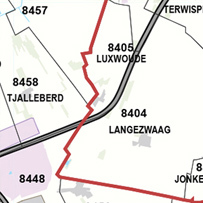 Provincial boundaries can also be displayed on the map, and this is often already done by default. It is, of course, no problem to add additional data. Please feel free to ask us for all the options. Customers, franchise organisations and entrepreneurs often want to map a district/territory. In many cases, you could split these kind of maps into two parts. One for the users who want to see as much detail as possible on a map in a single district/territory. Or, a map giving the user the overview of all districts/territories together. The end product is a digital map, optionally supplied with an Excel sheet. Data is everywhere and availableand in many forms. The trick is to shape the data as insightful as possible. Cartography has proven to be an excellent tool for this. See where your customers are, your business locations, your suppliers, or everything at once. 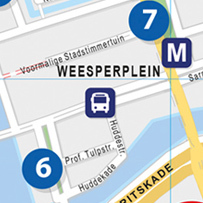 Based on an address we can add points, dots and symbols in different colours to the map. A custom made legend explains clearly where your (potential) customers are. A picture, or in this case a map, tells more than 1000 words. 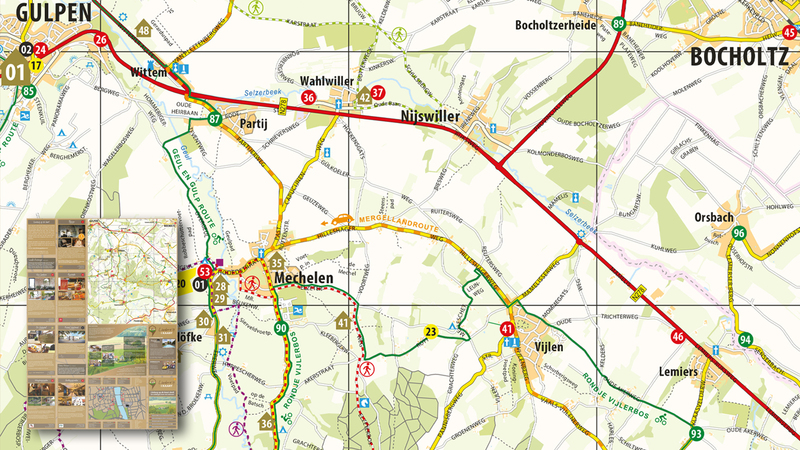 We can chart other data such as cycling routes and nodes, networks of hiking routes and your own data as well. For example, the route of your trip around the world, your own walking route, all your flights, etc. There are no boundaries — please tell us your ideas!